I decided to go out of my comfort zone and bake a cake with non-typical ingredient. I didn't roll the dice to decide which one I will use, but it certainly felt like I was gambling with my baking reputation among friends and family that like my baking just as it is, traditional - with little modern twist (their words, not mine). And I emphasize a little. Avocado was an obvious choice because I wanted to make a somewhat healthier icing and replace butter as the fat. My verdict - beautiful combination of chocolate and avocado! My daughters verdict? - Calpol Cake. If I didn't tell the crowd what gave the cake that gorgeous velvety and silky green colour, I am certain that the cake would of have had a much warmer welcome. But ,with the main ingredient revealed while the cake was still in a fridge,I had a hard time convincing them to even take a bite. Luckily, my sister, who doesn't like very sweet desserts, came to the rescue and we had few bonding, sister to sister talks over this cake. 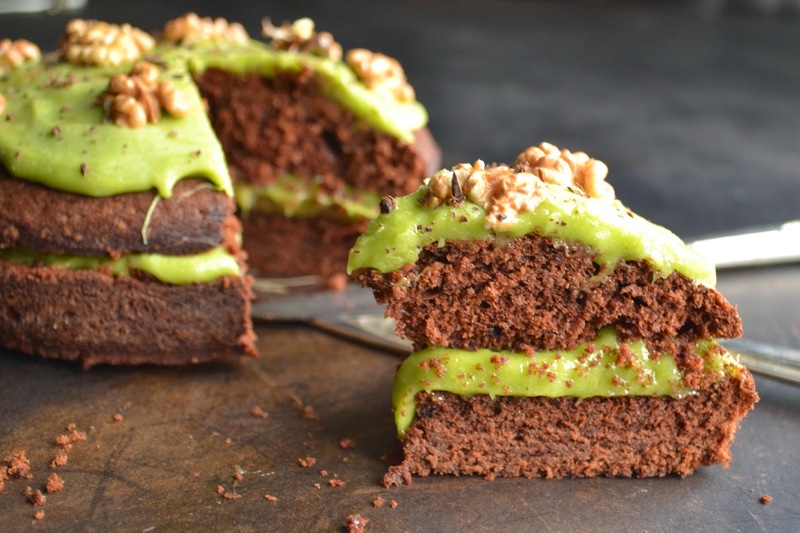 For the sake of my waist, I will be using avocado the old fashion way- in salads and dips, and postpone my plans to make chocolate- beetroot cake, until further notice! Preheat the oven to 180 C/gas mark 6, oil 24 cm round tin and lay the bottom with parchment paper. Melt the chocolate with coffee powder then set aside. Beat the sugar with butter and mix the rest of the dry ingredients together in a separate bowl. Add the eggs, one at the time to the butter mixture until they are well incorporated, then combine the half of the flour mixture, add yoghurt and then the rest of the flour. At the end pour the cooled, melted chocolate and mix to get even smooth texture. Bake for about 25 minutes or until a cocktail stick comes out clean. Leave in the tin for 10 to 15 minutes and then transfer to a wire rack to cool down. For the cream it's the best to use a food processor or a blender. Blend the avocado with lemon juice until all lumps disperser, then start adding icing sugar and keep blending on a mid to high speed until you get a nice smooth and thick consistency. If it is not thick enough just add a bit more sugar as you go, make sure that you do not put too much as it will firm up in the fridge. Cut the sponge into half fill with the half of the cream, reserving the other half for the top. 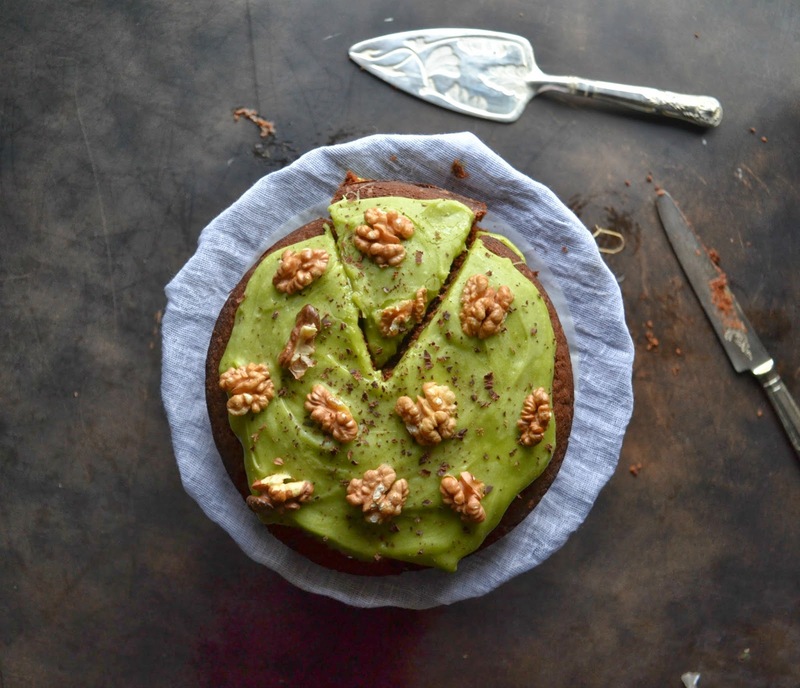 Decorate with roasted walnuts.